Your manager asked you to look into the overall sales and profitability for the company and to identify key areas for improvement. You have a bunch of data, but you aren’t sure where to start. With a free trial of Tableau Desktop, you decide to begin there. 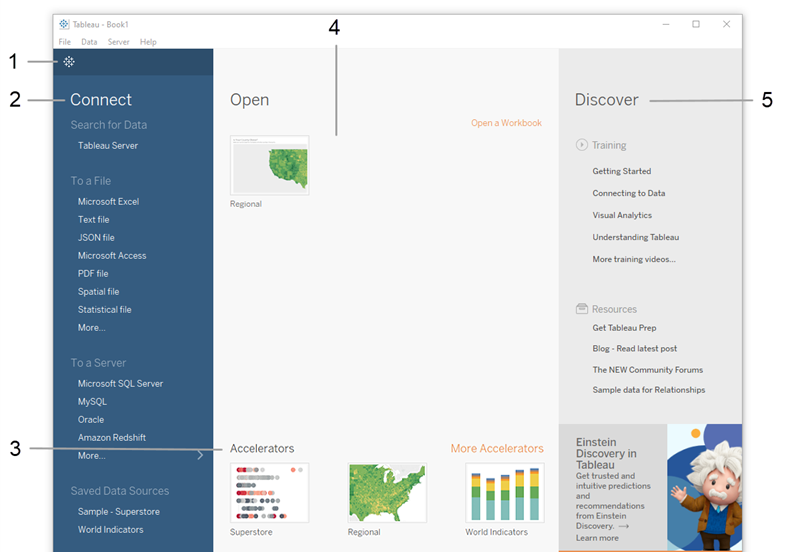 The first thing you see after you open Tableau Desktop is the start page. Here, you select the connector (how you will connect to your data) that you want to use. Click the Tableau icon in the upper left-hand corner of any page to toggle between the start page and the authoring workspace. Connect to data that is stored in a file, such as Microsoft Excel, PDF, Spatial files, and more. Connect to data that is stored on a server, such as Tableau Server, Microsoft SQL Server, Google Analytics, and more. Connect to a data source that you’ve connected to before. Tableau supports the ability to connect to a wide variety of data stored in a wide variety of places. The Connect pane lists the most common places that you might want to connect to, or click the More links to see more options. More on connecting to data sources in the Learning Library (in the top menu). Under Open, you can open workbooks that you have already created. 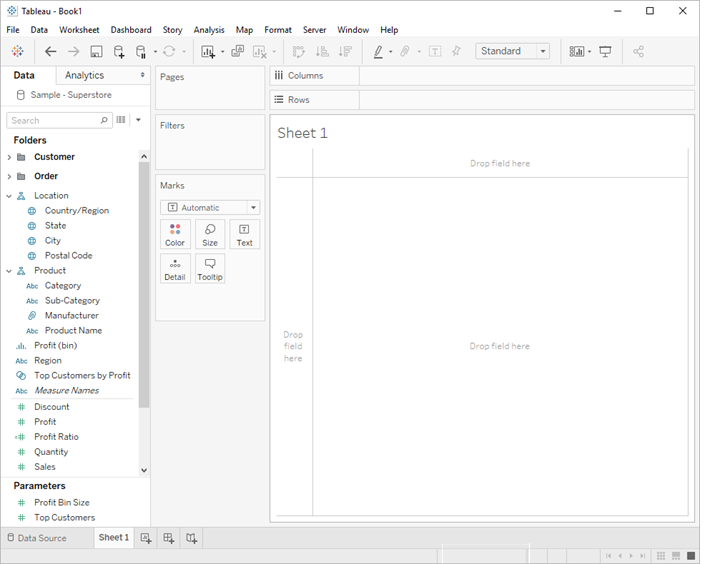 Under Sample Workbooks, view sample dashboards and worksheets that come with Tableau Desktop. Under Discover, find additional resources like video tutorials, forums, or the “Viz of the week” to get ideas about what you can build. The Sample - Superstore data set comes with Tableau. It contains information about products, sales, profits, and so on that you can use to identify key areas for improvement within this fictitious company. Learn more: What is Tableau doing with your data? Opens a new worksheet. This is a blank slate where you can create your first view. Displays the data source you are connected to. If you are using multiple data sources, you can see them all listed here. Adds columns from your data source to the Data pane on the left-hand side. Columns are added as fields. If you want the juicy details, you can select the Data Source tab in the bottom left-hand corner. Here, you can view the first 1,000 rows of your data, and some analysts go nuts: Sort or hide fields, split fields into multiple columns, and rename column headers, all without modifying the original data. What happens in Tableau stays in Tableau; your data is safe. Note: If you navigated to Data Source to check out the details, just click on the tab for Sheet 1 to get back to where you started. More on the Data Source page in the Learning Library (in the top menu). Learn more: Prepare your own data. When you connect to your own data, you might need to do some prep work before connecting to it in Tableau. This is because Tableau makes assumptions about your data so that it can display it properly for you to work with. More on preparing your data in the Learning Library (in the top menu). Continue to Step 2: Drag and drop to take a first look.